One of my favorite books I've read recently is entitled "Love Does" by Bob Goff. If you've never had the privilege of hearing or reading this man's words, I HIGHLY recommend checking him out! Bob's mission is simply to love the people around him extravagantly - and not just the people who make it easy to love them, but the people who are tough to love - the people who annoy us, get under our skin, make us want to bang our head against a wall - you catch my drift. Anyways, while reading this book, I came across a story that totally blew me away. One teeny tiny important detail you have to know about Bob Goff is that he is the Honorary Consul for the Republic of Uganda, and that his book "Love Does" is actually the name of his nonprofit that starts schools in areas of the world that are in unrest - like Uganda, Iraq, Iran, etc. One of the stories in his book details the first time he started one of these schools with his friend. They sent out, like a bajillion letters, telling parents and families that they were going to open a school for their kids, and only a few came. I think the number was between three and five (it's been a while since I read this book!) But really, it's not the exact numbers that matter in this case, just the HUGE difference between how many flyers they had sent out and how many kids had actually showed up. Bob had a freakin' field day. I remember him saying something in the book like they were too busy fist bumping and shouting for joy that they got ANY kids to come to even think about being disappointed that more hadn't shown up. This man decided that those kids were the exact kids that God had wanted he and his friend to love that day. And you know what's really awesome? God blessed their faithfulness with what they were given and grew that school over the years into hundreds. And now there are multiple schools in multiple countries just like that first one. Who are we to think that what we've been given isn't enough? Maybe it's actually exactly what God wants us to have. Maybe it's what we're supposed to have. And maybe we're just called to love the people that God puts in front of us - whether it's one person or one hundred people. When not a ton of people jumped on these sessions, I was a little bummed - slightly disappointed. I was tempted to feel like I had failed because these time slots weren't overflowing with people. But then - I remembered Bob's response, and I realized how incredibly BLESSED I was to be able to serve and love on these three families who were trusting me with the honor of photographing the people they loved most. And I don't say that just to say it - I truly feel that God brought exactly who he wanted to be here to these sessions! To the families who I had the honor of working with - THANK YOU! I was blessed by each one of you and am SO thankful to be able to continue loving on you all! And if you're interested in reading the book that inspired this post, click here! 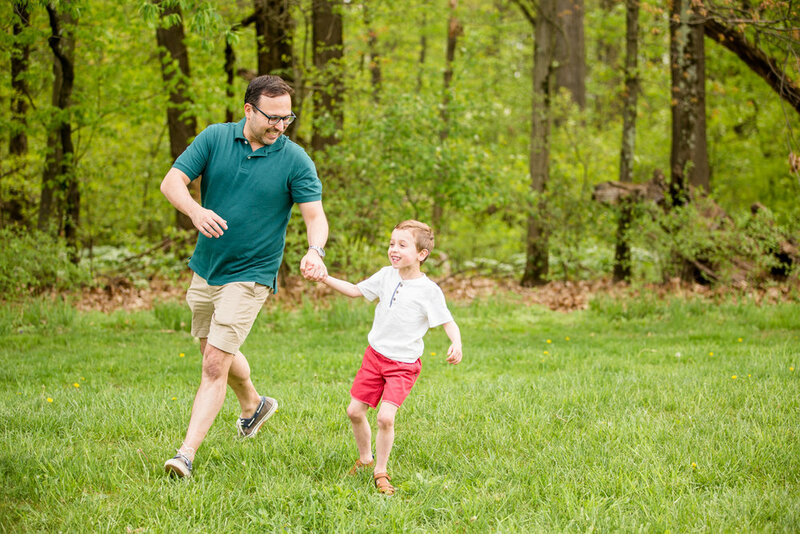 My husband, also an avid Bob Goff fan, wrote a bit about Bob's content and it's awesome! Check it here! 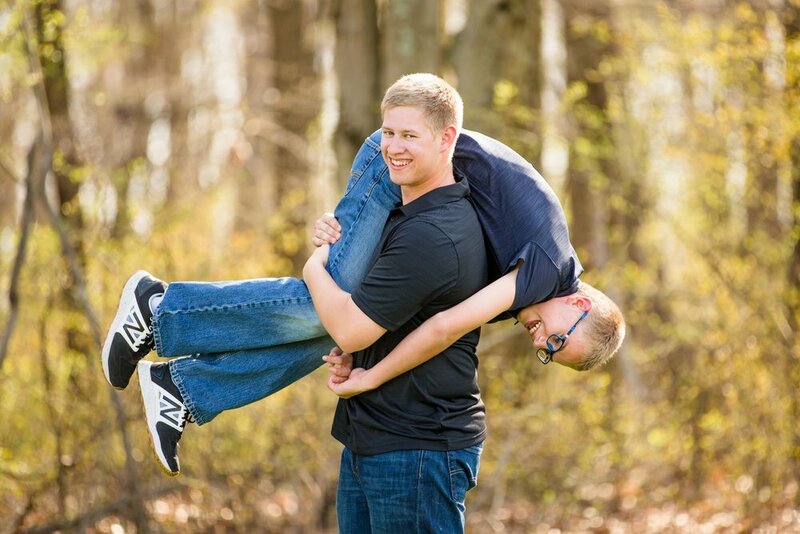 For a location, we decided on one of my favorites for family photos - Cranberry Township Park! This spot in particular is one of my secret favorites. The light is always so beautiful there! As a side note, if you're interested, I'll be hosing a mini session date as this EXACT spot on Friday, May 11th. If you're interested in learning more or signing up, click here! We had SO much fun during this session for so many reasons. 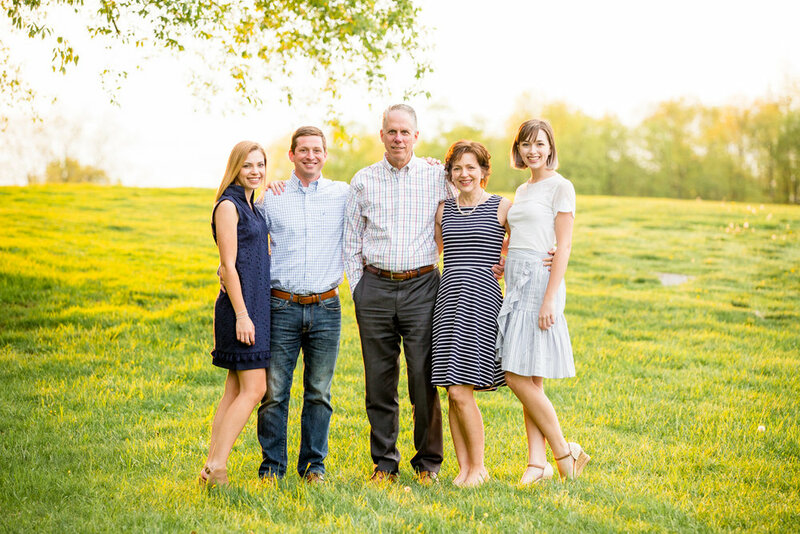 This sweet family is so laid back and easy going, and quite obviously love spending time together. Because Chance and Cooper (the boys) both play baseball, and Kyle (dad) works for the Pittsburgh Pirates, they decided to bring along some baseball gear to incorporate into their photos (which I love!). A couple of bats and a few gloves were the perfect personal touch for their portraits! During the session, there was also some intermittent frog catching in the pond nearby - Chance quite literally caught one with his bare hands! 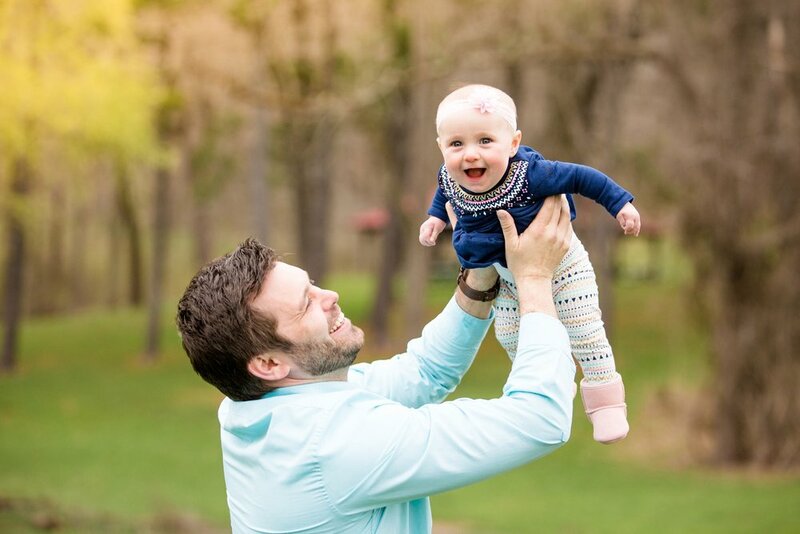 I just love this family and am so excited to share their photos! Check out a few of my favorites below! Get a Dose of JHP Straight to Your Inbox! JHP FINALLY has an email list and I couldn't be more excited about it!! Over the course of the last year, I've had numerous current, former, and soon-to-be clients ask if there is a way they could stay updated on a monthly to bi-monthly basis with things like mini-session dates, cancellations, print specials, the latest blog posts new offerings, discounts, and the like, and I'm finally excited to open up this email list to anyone who would like to join! If you are someone who is looking to stay updated on all things JHP, then this email list is certainly for you. Sign up below! All the best info delivered straight to your inbox! I am so excited to share this beautiful family session with you all! Elissa, Josiah, Lily and Ady are four of the sweetest individuals and were so easy to photograph from start to finish. Elissa and Josiah serve on the music team at the same church my husband works at and both have absolutely PHENOMENAL voices! Their love for each other radiated throughout the entire session, and they were willing to trek through mud and fields for the very best shots. Thank you so much for trusting me to take these photos for you all, it was such an honor! 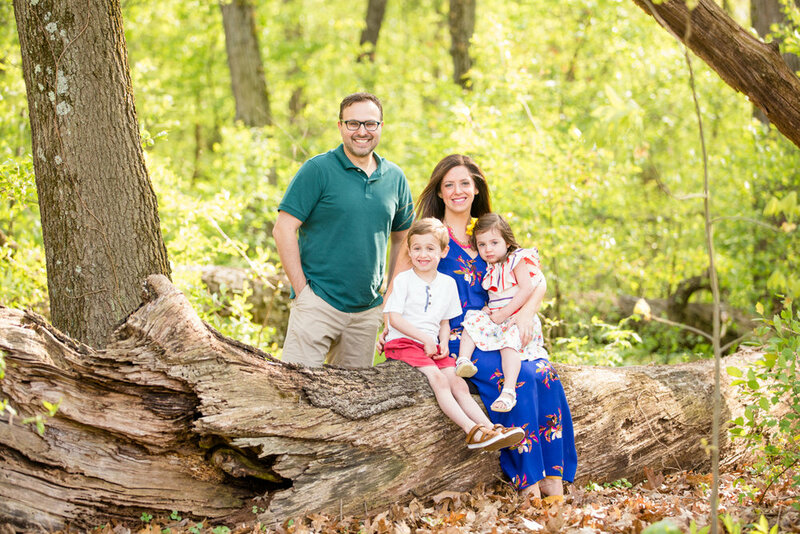 Moraine State Park is the perfect natural setting for family portraits! With lots of space and tons of beautiful natural scenery - including a forest, a field, a gravel road, docks, and the lake, there are lots of different locations to choose from! Moraine looks particularly beautiful during the spring, summer, and fall months. McConnell's Mill is one of my favorite locations because there is SO much variety and it looks good in every single season! From roads to rocks to forest to the creek, McConnell's Mill has so many beautiful backdrop to choose from! Hartwood Acres might be one of my all time favorites! With a beautiful mansion, gardens, and a courtyard (surrounded by lots of forest), Hartwood has so much to offer! And the best part? It looks gorgeous all year round! However, if you're looking for lush greenery and gardens, I recommend booking in the late spring, summer or fall. Cleland Rock is technically a part of McConnell's Mill, but it's about a 10 to 15 minute drive from the main McConnell's Park hub (near the Mill). Cleland Rock has sweeping, West Virginia-like scenery and beautiful fields. This location looks gorgeous year round! This location is one of my secret favorites - right near the Cranberry Community Dog Park! While this spot ALSO looks beautiful year round, it's my favorite in the fall! Mellon Park is the perfect choice if you're looking for a blend of natural and architectural scenery! This little park is nestled near Oakland and has lots of beautiful light. With the architecture, it is a great year round choice, but looks especially beautiful in the summer months! 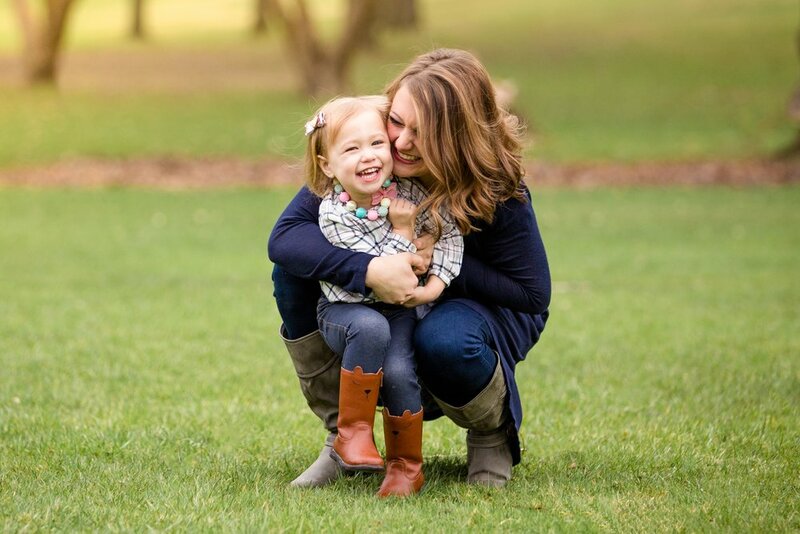 Introducing Spring 2018 Mini Sessions! I am SO EXCITED to share something I've been hoping to do for quite a while now. Over the last couple years, I have been so blessed with an increased amount of seniors, couples, and families to serve. In the interest of providing more people with photos, this year - for the first time, ever - I'm so excited to announce the first ever JHP Mini Sessions (Spring edition)! Bring your parents, grandparents, cousins, uncles, aunts, and whoever else you can think of! If you are interested in joining us, check out the details below - can't wait to see you there! ready to book? click here! What do you do when your son lives across the country?! Schedule family photos for when he's back in town and the whole family is together! 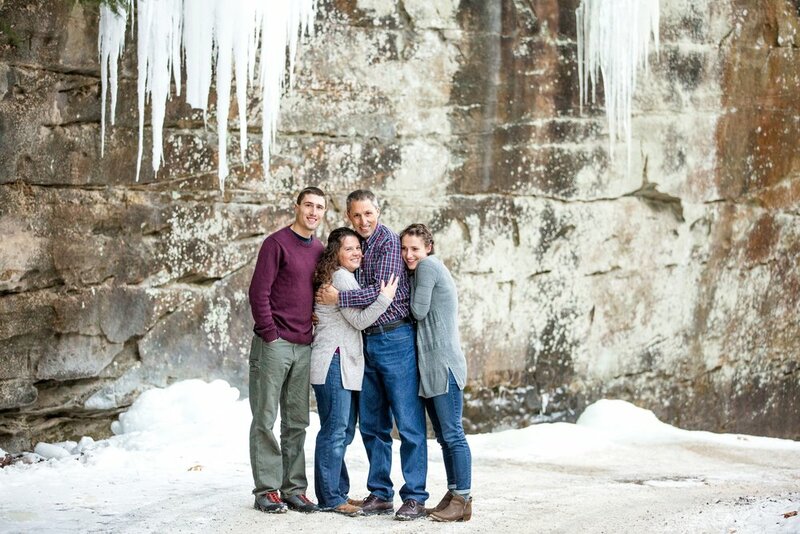 The cold weather didn't deter this family in the least from having a couple of family photos taken at McConnell's Mill a few weeks ago - the snow covered roads and large icicles made for some unique scenery for this sweet family's session, and I am so thankful to have been the one to capture these for them! Have you ever considered having family, senior, or engagement photos taken during the winter months? Here in Western Pennsylvania, where winters can be long and cold, not quite as many people venture out on location for photos in the dead of winter when they can curl up in front of the fire with a cup of coffee instead (I’m totally putting myself in that group of people!!). BUT if a winter photo session has ever peeked your interest as a possibility, I’ve put together a little pros and cons list to share the good and the not so good of scheduling a winter photo session! We’ll get to utilize breathtaking and unique backgrounds. When I’m driving past a mountain of freshly snow covered trees, I often stare in awe. There’s something so beautiful about freshly fallen snow that makes for a clean, gorgeous backdrop, not just when you’re driving to work but when you’re having your photos taken! You’ll have that “cozy feeling” in your photos. There’s something about having your photos taken in the winter that immediately creates a “cozy” feeling, especially during engagement and couple sessions where you are going to be close and cuddled up anyways! You’ll have more times to choose from with a higher probability of weekend dates being available! Because there’s less demand for photos in the winter, I usually have more timeslots available, both during weekdays and on weekends. Essentially, scheduling in the winter means you’ll get a fast pass to the front of the scheduling line! The obvious one: it’s COLD! Consider this test: does thinking about being out in the cold for 60 to 90 minutes make you want to never leave your house again? Then a winter photo session might not be the best choice for you. While some people don’t mind being out in the cold for an extended period of time, others would much rather wait until the warmer months (which is completely understandable!). There’s a higher chance that your session might be cancelled or postponed due to extreme temperatures or inclement weather. Flexibility is key for winter sessions. There’s a chance your session could be snowed out (while snow is beautiful in photos, it’s not worth endangering your life for) or postponed due to freezing temperatures (who even likes to walk to their car in -5 degree weather?!). Being flexible is KEY! It might not be the most enjoyable hour/hour and a half of your life. This one kind of speaks for itself – hanging out in the park in 15 degree weather isn’t nearly as fun as watching the sun set on a 70 degree day. The truth is, having a photo session the winter means you might be cold to your core! What do you think? When considering the pros and cons - where do you fall? I write none of this to persuade anyone out of a winter session, but only to educate based on what some clients wish they would’ve known in the past. If you’re still interested in a winter photo session, be sure to check out my blog post “How to Prep for Your Winter Photo Session” for tips on preparing for a cold weather shoot! There are SO many things I love about photographing people in a winter setting. There are lots of unique and picturesque backgrounds, and the photos always end up having an overall “cozy” feeling to them! But what does it really take to have your photos taken in the dead of winter when it’s 20 degrees (or less!) outside? There are a couple of tips and tricks I’ve learned over the years that have helped make winter sessions more enjoyable for those who are brave enough to step in front of my camera. So if YOU are planning on having family photos, couple photos, or senior photos taken during the winter – these are my best tips for you! Make sure the first thing you’re thinking of when planning your outfits is WARMTH! Add accessories like scarves, hats, jackets, long boot socks and boots. Consider actually wearing a coat for your photos! Add layers underneath your chosen outfits – socks, long johns, an extra t-shirt – anything that will insulate you a little bit more! If you’ll be walking around in the snow, consider bringing a pair of snow boots for walking between locations so your “nice” boots or shoes don’t get ruined! Bring some EXTRA warmth with you for in between shots! I always bring a blanket or two with me to my sessions in the winter, but I highly recommend bringing extra for yourself if you think of it! This can be a lifesaver while walking between locations or even just between shots! Be willing to be flexible if the weather calls for it. There’s a higher chance of inclement weather, especially in Western Pennsylvania in the winter months, which means that a session could easily get snowed out or cancelled due to extreme temperatures. It’s not fun to have your photo taken in negative degree weather, which can make the session (and memories associated with it) somewhat unenjoyable, which is the very LAST thing I would ever want! As a firm believer that photo sessions can be (and should be) enjoyable, incorporating these tips and tricks into your winter photo session will ensure that you stay somewhat warm and toasty throughout your entire session! 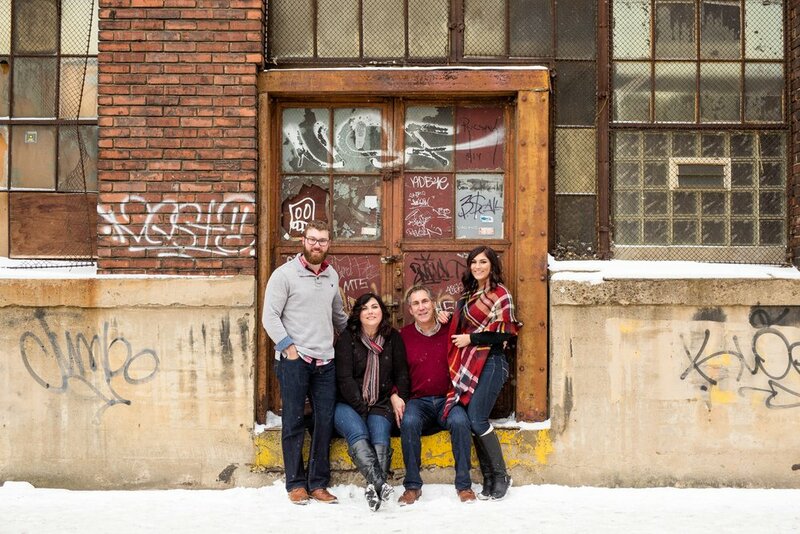 I had so much fun hanging out with the Parise family on a very cold and snowy Saturday in late December! These four people are four of my new heroes, because not only did they brave extremely cold temperatures for their family photos - but they took their jackets off and didn't even complain while we trekked all over the Strip District! And even though I came away with some minor frostbite (don't worry, I bought myself a nice new pair of boots for my upcoming winter sessions! ;) ) it was totally and completely worth it. And since these photos were a gift from kids and dad to mom (what a sweet idea, right?! ), I want to say a big happy birthday to Cheri! Here's to many, many more years with those you love!